The International Sociological Association hosted its third major forum in Vienna this month. (ISA forums are organized every four years; previous forums took place in Buenos Aires and Barcelona.) Nearly five thousand sociologists (and researchers in cognate disciplines) came together from countries all over the world, contributing to over 700 sessions in five days. So one might look at this as a great opportunity for distilling a map of the topics that are the most urgent for social researchers in many countries today. The program provides a first-hand exposure to a point Gabriel Abend makes about national differences in the practice of sociology (link); attendance at multiple sessions makes it apparent that there are substantial differences in topics, methods, and vocabularies across national and cultural research communities in sociology. It would be fascinating to see a network graph of citation clusters or keywords from the full list of papers to identify central topics. (The 829-page PDF book of abstracts might allow for some initial topic analysis along these lines.) What methods emerges as particularly compelling? What theoretical approaches and concepts are favored? The demographics of attendance would also be very interesting to study. What countries are represented? What is the gender composition of the attendees and panelists? What about age and rank in the profession? The ISA has provided a country breakdown for previous forums; I assume it will do so after the close of this event as well. Perhaps most difficult to assess, why did these individuals choose to participate? Is there a sense of deep engagement in a set of intellectual issues in the disciplines? Or is the dominant motivation one of career competition and progress? It would have been very interesting if ISA had organized an “ethnographic corps” of volunteers who did short interviews with attendees to learn a little more about their interests and reasons for attending. My non-scientific impression, based on assessing the audiences in several small sessions and a large common session, is that the attendance is skewed to a younger set of scholars, relative to attendance at the ASA. There are a good number of senior scholars (>60 years), but this segment seems to be less than 15% of a typical audience. In sessions I have attended the gender ratio is about 2:1 male:female and sometimes much more skewed. The age distribution of panel participants is more difficult to assess, but my impression is that panel participants tend to be more senior than the audiences. Gender representation among speakers appears to be substantially lower than the 33% female audience would suggest. 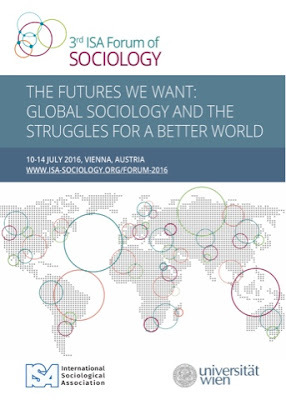 Studying this extensive conference in sociology seems like a good topic for investigation by researchers in the new sociology of ideas (link). I’m sure that Neil Gross, Michelle Lamont, or Andrew Abbott would have dozens of interesting questions to pose about this assemblage of the field of sociology in the process of renewing itself (as of course every discipline does on a continuing basis). The concept of “field” is particularly relevant here; many of the topic areas are actively engaged in contesting the various fields and institutions that constitute the sociology knowledge industry today. And of course the disastrous state of the academic marketplace in almost all of European universities is relevant; young scholars face almost impossible odds in seeking continuing faculty positions in their fields of expertise. In my view this forum has accomplished a lot of what we would want from an academic convening. Important topics were discussed with seriousness, and new ideas were shared with a world-wide audience of mostly younger scholars. At a time when anti-intellectualism seems to be at a high, ISA makes a strong case for the vitality of sociology and the likelihood that research in the disciplines of the social sciences can actually make a difference in achieving a better future.